Your pet fish must eat what you serve them, or face starvation (an option that happens all too often). Although flake food is a good staple, the vast majority of freshwater fish would literally jump at the chance to have live or even frozen foods. Before we dive into the topic of live food, let's talk about flake foods. Realistically, it's not possible for most of us to provide a completely balanced diet composed of only fresh and frozen foods. Flake food is accepted by a large number of freshwater fish and contains important nutrients your fish needs to stay healthy. However, not all flake foods are created equal. The next time you go to purchase flake food take a good look at the ingredients. What you'll find is fishmeal, yeast, shrimp meal, algae meal, plankton, kelp, vitamins, preservatives, and protein fillers such as wheat meal, soybean meal, oatmeal, and brown rice. Those last items are fillers. They are necessary to provide an adequate amount of protein but don't contain the same nutrients and flavor found in shrimp or other seafood. Remember that ingredients are listed in order of volume, so look for combinations that have the fishmeals and seafood high on the list. Now that you've stocked a supply of good quality flake food, start looking for ways to supplement those boring flakes with fresh or frozen foods. Tubifex, also known as "blackworms", have long been heralded as either the worst or the best live food to feed your fish. Like earthworms (who eat dirt), tubifex worms eat whatever material they are raised in. Brace yourself – most tubifex worms are raised in trout pond run-offs, which means they live on fish manure. Needless to say, that makes them potential hotbeds for transmitting bacterial or parasitic infections. Disgusting? Yes! 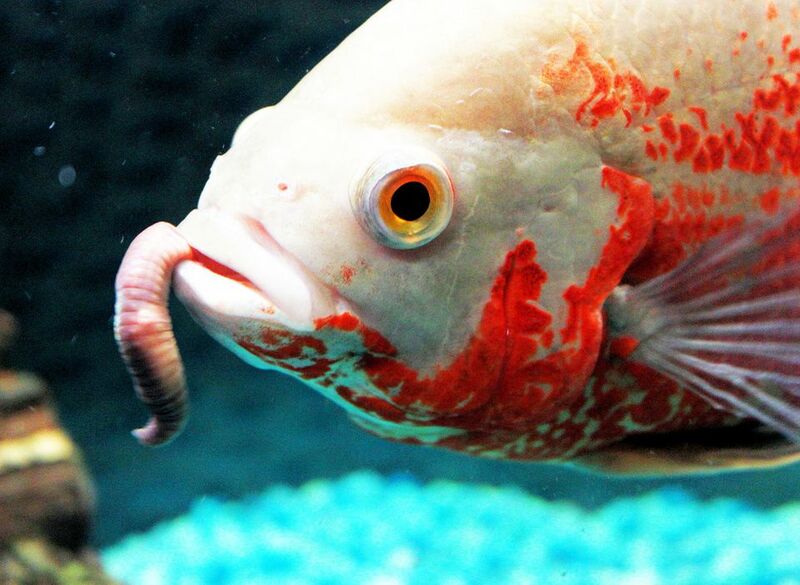 But freshwater fish love tubifex worms and thrive on them if they are cleaned properly. Start by purchasing your tubifex worms from a reputable store, then carefully examine the water they are housed in. It should be clear. If it isn't, don't purchase them. Place your worms in a large container, and 3 to 4 times a day rinse them thoroughly until the water runs clear. Store them in the refrigerator and examine the water each morning. If the water is clear they are clean. Don't feed them to your fish until the water is clear. The quality of tubifex will vary from store to store, so if you locate good ones (worms that clean quickly as opposed to ones who are still fouling the water after many days) make note of the supplier. One of the best live foods is Artemia, more commonly known as brine shrimp. If you've looked around for live brine shrimp you've probably discovered they are a bit pricey, or difficult to find at all. Don't give up. Most fish shops carry a good selection of frozen brine shrimp. The texture and flavor of brine shrimp will vary based on what they were fed and how they are frozen. Much like people, fish have distinct preferences when it comes to food. Don't hesitate to try several brands to find the one your fish likes the best. Regardless of whether you try frozen or live Artemia, you will be surprised to see how voraciously even small fish will consume them. Shrimp aren't the only "safe" live food available. Experts consider Daphnia, aka water fleas, one of the top live food choices. They carry none of the diseases that tubifex do, are an excellent source of nutrition for all fish, and can be raised fairly easily. If live food isn't available, is too costly, or is too much of a hassle to raise, frozen foods are a good alternative. Brine shrimp is the top-selling frozen food, but you shouldn't limit your fish to only shrimp (even steak gets boring after a while). There are many other frozen foods available, and some even combine several popular foods into a single mix that fish find very appealing. Spend a little time in the freezer section of your fish store. You won't find any Macadamia Nut ice cream, but you will find everything from krill, to kelp, to red algae. Wait, aren't algae and kelp plants? They sure are. Don't forget that even meat-eating fish will enjoy plants and vegetables. In fact, some vegetarians, such as the plecostomus, only eat plant material. You can satisfy the vegetarians with frozen kelp, frozen or freeze-dried algae, or bits of fresh lettuce and spinach. The next time you make a salad, wash the greens well and try feeding a small portion to your fish. You might be surprised to see which ones dig into it. What your mother told you about veggies being good for you holds true for your fish too. Fresh vegetables provide vitamins and roughage often lacking in other foods. Whether it's live or frozen, animal or vegetable, your fish will enjoy having a variety of foods offered to them. Remember, you are the only chef they have.